1. Position rack in bottom third of oven and preheat the oven to 350°F. 2. Cook the Smoked Bacon in very large pot over medium-high heat, stirring often, until the bacon is brown but not crispy, 8 to 10 minutes. 3. Add Garlic Sausage, BBQ Sausage, and Baltyk Ham. Sauté until meats start to brown, about 10 minutes. Add onions, celery, and bell peppers. Cook until vegetables begin to soften, stirring occasionally, 10 to 12 minutes. 4. Mix in chicken. Cook until outside of chicken turns white, stirring often, 5 to 6 minutes. 5. Mix in paprika, thyme, chili powder, and 1/4 teaspoon cayenne. Cook for 1 minute. 6. Add diced tomatoes with chiles and broth; stir to blend well. Add more cayenne, if desired. Mix in rice. 7. Bring mixture to boil. Cover pot. 8. 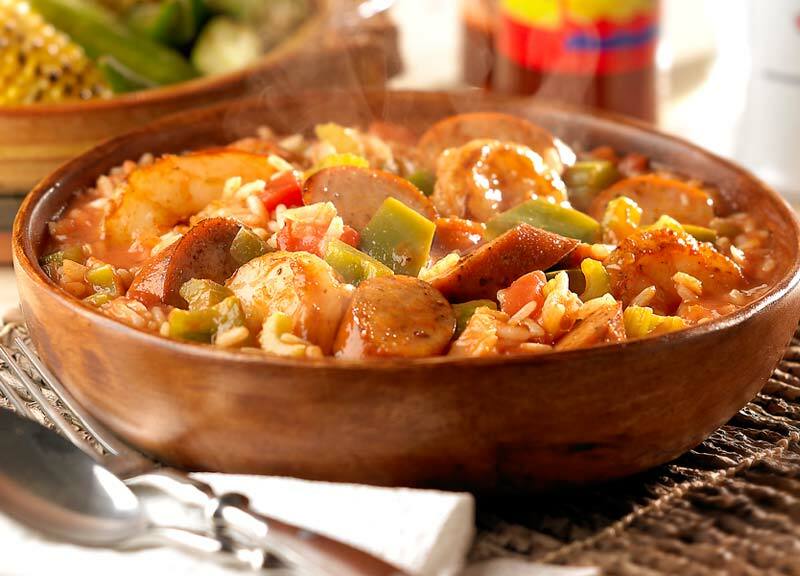 Place jambalaya into oven and bake until rice is tender and liquids are absorbed, 45 to 48 minutes. Uncover pot. 9. Mix chopped green onions into jambalaya, sprinkle jambalaya with chopped parsley and serve.